Audio from the IDAHOBIT flag raising ceremony held on the forecourt of Parliament. The event marked the International Day Against Homophobia, Transphobia, Biphobia and Intersexphobia. 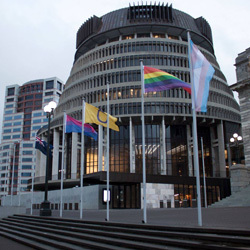 It is believed to be the first time in the world where the bisexual, transgender, intersex and rainbow flags have been flown together in front of the seat of government.